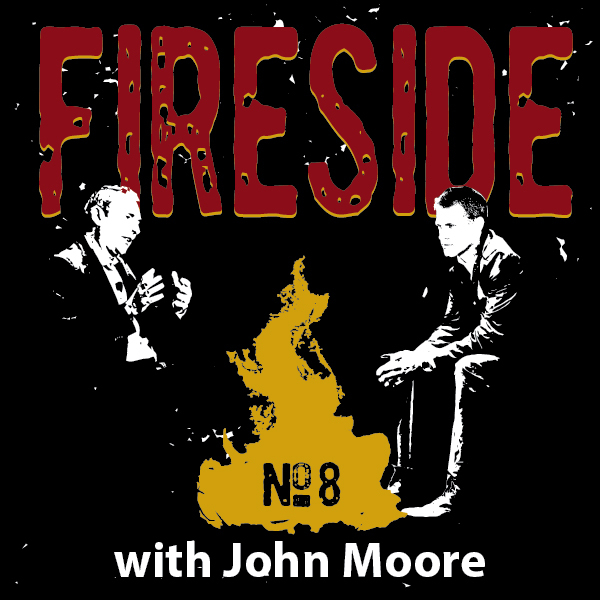 Today's guest is John Moore. John’s military experience as a weapons and tactics officer for F-4, A-10, and A-7 squadrons allows him to develop strategies to help each family he serves create a plan to successfully accomplish its financial missions. His training as a Certified Investment Management Analyst allows him to keep a critical eye on the various strategies implemented by the JMA Investment Committee. With more than three decades in the investment world, his history and experience are invaluable at understanding markets and the appropriate strategies to address an ever-changing investment landscape. John still enjoys flying his 1968 Beechcraft Bonanza and tinkering with the office computers. John Moore: Well, the Mercy Me song Dear Younger Me comes to mind! Your question actually is something I’ve spent some time thinking about lately. As a parent, grandparent, business leader, and principal in the middle of a three-generation continuity plan, I’m inspired to lead and coach the two generations behind me. I’m realizing more and more that you can’t really separate the personal side of what you do from business. I don’t think I appreciated that reality when I was young, how tightly woven together these things are. If you get one or the other right, it benefits the other, and when you don’t, it negatively impacts the other. What you learn from one informs the other, and so forth. Blake: Ah, that’s good. I think integration is the way to go, too, and that it’s really about blending and boundaries versus balance. If you are fortunate enough to love what you do, work is simply an extension of play. John: I'm really thinking about it in terms of what I might have done differently. I guess historically I tended to treat balance more like a barbell. In other words, I would work really hard and then maybe play really hard, or I might sacrifice some family time because I knew that once a year we're going to take two weeks together uninterrupted, and basically I would let myself get away with maybe not having proper balance because I can count on the barbell and making up for lost time later. It seems to me that time, the distance between each end, should be shorter. If that makes any sense. Blake: Sure it does. At some point, if the bar gets short enough, the ends bump into each other and integrate. I think partitioning things is key, like not being on your cell phone at dinner with your family, but you know, finding a way to live a whole life now, not just in the summer or during holidays. John: I think that especially now, with grandchildren, I’ve learned I can’t afford to partition it. Life’s too short. There’s no such thing as ‘quality time’ with an infant, only ‘time.’ Unless you’re there, showing up, there’s no quality, and certainly no memorable things can happen. That’s probably one of the things that really weighs on me when I look back at being a young father. I was guilty of being gone a lot. It’s easy to blame the career and building a business, but that’s all it is. When I look back, I’m at least grateful for having carved out two weeks every year to create quantity time, which led to quality time. Blake: What other epiphanies are you having? John: I was in a meeting this week, and one of the speakers shared an interesting discovery of his. He described the importance of creating a culture in business, and of service, but he also described a third dimension: hospitality. And hospitality is all about paying attention to the people around you and going out of your way to help them whenever you see an opportunity. The example he used really resonated with me. He said that when his company interviews people, usually five people have already interviewed the candidates before they make it to him, and one of the things he always does is to drop his pen off a desk and wait to see if the candidate will pick up the pen. He said if they don't pick up the pen, they're not getting the job! A lot of people are qualified, or technically competent, but dropping a pen is a simple way to see if the person sitting across from you fits in the kind of culture you’re wanting to create. Blake: Have you been able to apply the pen trick in an interview yet? John: Yesterday I was on a Southwest Airlines flight coming back from Chicago and noticed this older couple that was going to have to sit separately because there were no seat pairs left. I gave up my seat so they could sit together. I’m suddenly aware of this hospitality thing, which really isn’t part of my genes or make-up. John: One of the flight attendants noticed and offered to buy me a drink, so yeah, I thought it was pretty cool, too! Blake: Any more lessons to your younger self? John: I think another thing that applies both to business and family, and that I should have implemented earlier, is coaching. I was pretty good at encouraging people, most of the time, but coaching isn’t exactly my strong suit. In hindsight, I probably had the skills to be a better coach, just not the courage. Blake: I bet that’ll be critical as you execute your continuity plan. John: We all experience teachable moments. Like they say, “Your mistake is tuition; don’t miss the lesson.” I learned a lot as a parent that now I’m able to apply to grandparenting, and business informs personal and personal informs business. Blake: Sounds like an integrated life to me! You’ve also always struck me as a really principled person. Can you talk a bit about values? John: Sure. We have 10 core principles that guide our company. 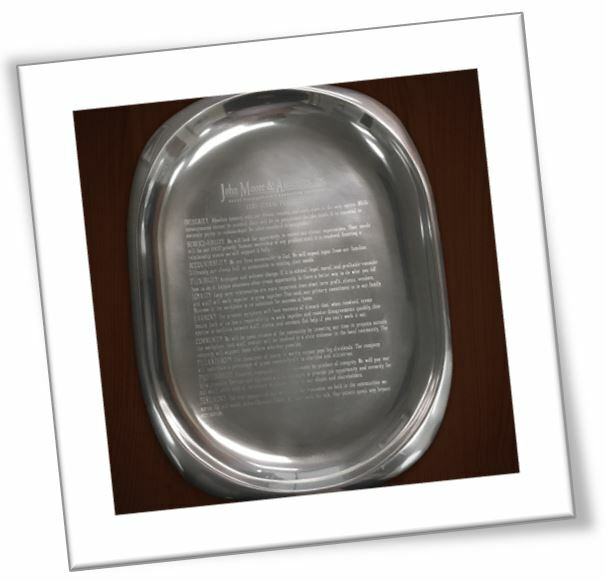 They’re engraved on Nambe ware that sits in both our Albuquerque and Scottsdale offices. Maybe the best way to explain their importance is to pick one, say, Philanthropy, and describe the earth-shaking process we recently went through when we changed it to Generosity. John: Something happened to Connie (my wife) and me. We attended a generous giving conference and began to understand that we were “tickled tithers.” That meant we were very comfortable giving our 10% and kind of checking that box, and then doing whatever we wanted to with the rest of what God had blessed us with financially. We were challenged by some of the stories that givers were sharing at the conference, and began to realize that generosity was a much better word to describe what we were trying to encourage in ourselves, our team members, and our clients. I was trying to figure out a way to describe the difference, so I started asking people what they thought the difference was between generosity and philanthropy. We were interviewing a young woman for a position, so I asked her the question, “What do you think the difference is between generosity and philanthropy?” and she thought for a minute and said, “Philanthropy sounds stuffy, and generosity sounds kind of fun.” Needless to say, she got the job, and that’s exactly how we think of it now, too. Blake: As a principle-driven company, how does changing that value change the way you counsel investors and clients? John: Well, we began talking about an idea we call 10+1, which says if you’re not sure how much to give, consider giving 10% of your income and 1% of your assets. Most people think of giving from the income side, when in fact the real opportunity is on the asset side. Proverbs 3:9 speaks to this directly by instructing us to honor the Lord with our wealth, which includes our assets as well as our income. Blake: What’s the outcome of this? John: It's counterintuitive to give away assets, especially in our business when we’re paid on asset value, but it’s God’s economy—not ours—and ultimately reflects what we call wise giving. We started tracking assets in 2012, and since that time we’re now over $15 million that has come out of Raymond James accounts into the communities and causes that people care about. We celebrate this and think it’s awesome! Blake: What do you see as the positive effects or impacts upon people who give—the actual givers themselves—who give generously? John: A couple thoughts. First, I would say that the way churches teach tithing may actually be the enemy of generosity, because when it comes to tithing…maybe we just want to check the box or fill the square, when perhaps we are called to an even greater amount than 10%. So in our business, we don’t tell investors what to give, we just challenge them to spend time thinking about what they feel they should give. There are numerous studies indicating that generous people are more at peace. Generosity is the antidote for greed. Once a giver begins to view money not as his or her own, and reprioritizes, they hold money loosely, answering the more fundamental question of how much is enough? When you come to answer that question, the second question is about your family—what you think they need—and the third and final question is about what will I do with the rest? Answering how much is enough brings such a sense of peace to your life, and joy, because it frees investors and givers up to be more generous, and is also a great conversation starter for couples and families. Blake: I suppose many couples and families realize they can give at any level. It’s not just for the wealthy, right? John: We counseled a young widow whose husband had been killed in a car accident, and the death benefit was very modest. They had some income as a result, but nothing extra each month, to be sure. But she wanted to give nonetheless, which we found very humbling and convicting, right, this young mother of three, who’s raising these babies on her own. So what did she do? She wanted to raise money to pay for Bible translation services for an Albuquerque group called Faith Comes By Hearing, so she organized a neighborhood garage sale. Word got out, and eventually six families committed to match whatever her neighborhood raised in the sale. John: When they finished their garage sale on Saturday, they counted up the money and it was $2,500. $2,500 times 6 equals $15,000, and when they took it to Faith Comes By Hearing, they learned that a Bible society was also matching every gift—dollar for dollar—so they turned $15,000 into $30,000! John: Wow is right, and that’s still giving out of assets, right, not income, so it’s a tremendous example to teach children about leverage and stepping out in faith. If they hadn’t generated $30,000, they still would have generated the $2,500, which is $2,500 more than they’d had if they’d just sat on depreciating assets cluttering up the garage. Blake: That’s a great lesson on generosity, John, and making a difference even when you doubt you can. And with services like Kickstarter and GoFundMe, I can only imagine the possibilities today. John: I hadn’t thought about giving in the context of social media these days, but you’re right, there are more and more ways to engage, to invest, to give, to fund others’ pursuits, to make a difference in people’s lives. Blake: I’m sure there are some shady sites out there too, though. Are there particularly reputable websites you’d recommend for people who want to explore giving? John: One is called Giving.org, and there’s another one, JustGiving.com. And as an individual, you can also create a fundraising page on FirstGiving.com, and it ends up being a very powerful tool if you can share your story and then point people to a cause, and the money actually goes to the nonprofit, not to the person raising the money, so it might not go directly to help you, but obviously this is a great way to involve people in causes you care about. Blake: Great recommendations, thank you. Continuing that thread, John, where do you suggest our readers go for financial advice? Or for online calculators? Where do they go if they want to give and don't know how, or to whom, or what the proper principles of giving are? Are there groups out there, like the ones you just mentioned, that are reputable resources for people who have never worked with a professional financial advisor? John: I would suggest readers start with GenerousGiving.org, which is a reputable ministry fully funded by the Maclellan Foundation out of Chattanooga, TN. They don't ever ask for money, they won’t take donations, and their entire mission is to teach people to be more generous. Their website includes a number of wonderful personal testimonials that explain individuals’ and couples’ giving journey. It’s a real encouragement when it comes to learning how other people give. Another great resource is National Christian Foundation. They work closely with Generous Giving. We describe to our clients that NCF is “the toolbox with a heart,” because they have a donor-advised fund platform, and that’s the one we primarily use, but there are other good platforms out there like Fidelity and Vanguard. Most of the major brokerage firms have their own donor-advised fund platforms, but the difference is that the National Christian platform will always view giving through a Biblically-based screen, which is important for a number of our investor and giver clients. Savvy clients come to the conclusion that the worldview of their advisor matters, and while we may not all agree on where our money goes, agreeing on the means by which we determine where it goes is essential. There’s also a group called Kingdom Advisors. Their advisors are certified in a course of study that heightens Biblical wisdom, so readers can search for advisors in their area using their website. They also have attorneys, CPAs, investment professionals, financial planners, the works, so do consider checking them out. Calculator-wise, any of the major mutual fund companies have good calculators in my opinion, so my advice there would be to encourage folks to get an advisor they can have a solid relationship with because it is about much more than just numbers. When you get down to how am I going to plan for the future, there are a lot of questions that need to be asked and answered because it’s not just about money; it’s about way more than that. And it should be, and that may be one of the screens when you meet with someone for the first time about whether they are a good fit for your worldview. Blake: I know that you’ve written a bit about this in the past, but are there any books that you’d recommend in that vein? John: My business partner, Brian Cochran, CFP®, is working on a book right now that will tackle, among other things, how much is enough? Another book that I love right now is called Plastic Donuts, by a friend of mine from Tulsa named Jeff Anderson. Blake: Oh, man, that’s a great title. Very sticky! I can guess the analogy, but lay it on me, Sir, lay it on me. John: It’s about his young daughter bringing in plastic donuts for a tea. How are you going to react? Blake: You’re going to pretend to eat them, and to love them. John: Exactly. You’re going to pretend to eat them and you’re going to pretend they’re the best donuts you’ve ever tasted, so the idea is that we should be thinking like that when it comes our giving decisions. That basically we’re giving plastic donuts to the Father. We want to do what makes Him smile in terms of our giving. It strips away the legalistic 10% component and really positions generosity in a completely different light. It’s not that the donuts are real, it’s that they’re presented by the child as the most wonderful donuts in the world, and that’s the spirit with which they’re accepted. God doesn’t need our money, but He loves a giving heart, and selfless spirit, and those who do good for others by being His hands and feet. Blake: That is so cool. It reminds me a bit of that plastic pearl necklace story I’ve heard, the one where the dad has a real pearl necklace for his daughter, but he doesn’t give it to her until she’s willing to give him her plastic necklace. Blake: We’ve talked about values, and resources. Business ethics is important to me, and anyone I do business with, but I also know it’s wildly important to you. Would you mind walking us through your thoughts on business ethics? John: Love to. We were recently nominated for and received the New Mexico Ethics In Business Award in the For Profit category. It’s been very humbling. Your company must be nominated; you obviously don’t nominate yourself for an ethics award! The fact that someone took the time to nominate us, followed by the process that we went through, was very cool. I want to put it out there as an idea that maybe some other NM-based employers can use, because it’s so rigorous and revealing and rewarding. It’s sponsored by Good Samaritan [Samaritan Counseling Center] here in Albuquerque, but they do it in conjunction with the University of New Mexico Anderson School of Management, and it’s a school project for the Ethics class. After getting nominated, a team of five or six students comes in and spends time interviewing you and researching your organization. The questions they ask are really phenomenal at getting to the soul of your business. The young man leading the team that interviewed us was Muslim, but when we described our Christian values it proved to be such a wonderful bridge. The whole process gets double-checked by a separate party to see if you’re for real, so it’s cool from start to finish. Blake: What was your take-away? John: That we’re for real! I think any process that forces self-reflection, that tests your values, that questions whether you are what you profess to be, is worth the effort. Blake: I guess this brings us full circle, then, eh? The golden thread that began with your values is evident in your ethics and how clients and peers view your company. I think that’s a tremendous testament to your principles-driven leadership philosophy and management practice. John: I pay tribute to a great deal of work from family and friends and lifelong clients who have gotten us to this point. We profess the importance of vision, mission, values to our team, and those we serve, so it’s very rewarding to be acknowledged for that by the outside world. I think some organizations are boss-centric, and we’re values-based, but it’s hard to know what that means until you have to show proof of it to five students from different walks of life who arrive curious and perhaps more than a little bit skeptical! Blake: Was the process equally rewarding for your team? For your associates? John: The process included video interviews with our entire team, and I can honestly say there has rarely been a prouder, more rewarding moment for me than watching those clips of my team describing their favorite value. I’d never asked them that question, and it was really interesting to hear their responses and see the impact on the team that interviewed them. I think there are a lot of icky things that go on in ‘the real world of business,’ so the idea of celebrating ethics in business and seeing the positive impact on this group of young interviewers was a reward in and of itself. Blake: Oh, man, I bet it was. Listen, let’s pivot to the idea of continuity plans, because I know you’re in the middle of one right now with Brian, and I also know how fraught such transitions can be. Can you walk us through how you’re addressing it? John: We celebrated our 20th anniversary in March 2017, so our theme lately has been about “the next 20, not the last 20.” Thinking through the continuity of values is something Brian and I spend a lot of time talking about, and it’s a commitment we’ve made to clients…that they can always count on the same set of principles that blessed us—and them by extension—in these first two decades of service. Blake: What advice do you have for a principal, business leader, or small business owner for naming a partner or successor? You’ve witnessed numerous partnerships and continuity plans in your own client base. Do you have any observations about how to do this well? John: I think it starts with knowing your identity as a person, a leader, a company, because there are a lot of avenues one can pursue, from outright sale to shutting things down to finding successors and partners. I’ve seen clients execute all three paths. A lot of it has to do with whether there is a suitable person to take the reins. In Connie’s and my case, our eldest daughter was a strong candidate, having worked for us for eleven years, but our son-in-law was a successor in a CPA firm and she bravely told us, “We think one small business succession is enough risk for our family, so please exclude me from your equation.” As a father, obviously there’s a little disappointment, but at the same time I was proud of her and her willingness to be transparent with us. That conversation led to opening other doors, and because Connie and I were committed to continuity for our clients, we opted to not pursue selling our firm to one of the wire houses. Blake: How did you meet Brian? John: We knew each other through church, and I knew his background—which is rock-solid—so we had breakfast in May 2013, and the rest is history…and future! We had strong values-alignment, a similar vision of the industry, and what a great company should look like and be about. It was obvious to me that Brian would be a fantastic successor, so I was encouraged when we began brainstorming a 10-year plan together. The key was to be sure about one another before we made financial commitments, so we spoke often about how to pull this off successfully. Blake: And what does that entail? John: First and foremost, staying true to the values that have served us for so long. Then, honoring our internal team. What I feared would be a problem for our team—my retiring—proved to be a relief, because it came in the form of Brian and a plan for continuous service after me. Third was carrying on the practice’s or organization’s work with long-term clients by assuring them that Brian and I were cut from the same cloth. My passion has always been investments, and Brian has great skills in financial planning and investments, so together we began to elevate what we could bring to clients in terms of services and capabilities. Finding the person with complementary values, vision, and a strategy for the endgame has been a boon for us. We’ve improved our outlook, become more efficient along the way, and I’m encouraged that we’ll continue to grow and get better at what we do. Let me also say that as an owner-operator, a small business that has in many ways been a small family business, that letting go of one’s ego is key. Our business is not about John and Connie, and embracing that reality is really liberating. It frees us to structure a deal that is predicated on stewardship and client service, and four years into the plan with Brian, our team is closer than ever, our clients are excited about the future, and our spouses are happy and at peace. We try to be as transparent as possible with everyone involved, all the stakeholders, so that there are never any surprises, and we’re all on the same page every step of the way. Blake: Collaborating well in advance of the transition is key, because it gives you real-world opportunities to see whether you guys are a fit. John: Right. As I describe it, we’ve been “cohabitating” for four years now! We don’t operate in silos, his book and my book. We’ve created an ensemble. Typically, financial services are siloed, with an advisor, a support staff, and a vertical. We, alternatively, share everything, and tackle client opportunities as an entire company, drawing on all sorts of expertise. This way, clients get the best possible advice from JMA, not just John, or Brian, or one person or another. It’s a great way to serve a family that may have a number of needs, and it’s also motivating for our entire team, who gets to experience the whole enchilada. Blake: That sounds like the way great law firms operate. John: The ones that put clients first, yes. Even if it means sourcing external expertise in service to the client. Every client gets the same level of service and care, with the Biblical overlay of expertise, in which case sometimes an external expert is the quarterback. Whatever it takes, ensemble-wise, to give someone the best advice possible. Blake: I love the idea of a quarterback. I have a quarterback for my medical care—someone who knows everything about everything and everyone—and she’s been instrumental in keeping me healthy while I indulge in Dr. Peppers and queso! John: [Laughter] Okay! Yeah, quarterbacks are great, and in the same way a quarterback has plays and plans, they also “invest on purpose.” Having a plan, working it, knowing the investment and giving and retirement roadmap that you’re intentional about is a great way to unify the quarterback, the process, the advisor’s worldview, the values that drive it all, everything. In fact, to illuminate that point, I remember when I was stationed in the Air Force in South Carolina. We had a sailboat and would often take people out on the open ocean. When the waves get to rockin’, it’s helpful to look past them at the horizon, for stability. Investing on purpose enables you to manage the waves and turbulence in the short-term so you can stay focused on the long-term. John: When I think back on the many money mistakes that I’ve seen people make, they tend to revolve around forgetting where you’re going. It’s not just about money, it’s also about relationships. Maintaining proper vision makes all the difference in the world. John: And research shows that husbands and wives often view money very differently. Men tend to think of money like a river, always flowing and there’s more where that came from, while women tend to think of money like a lake. Guys often see the cash flow, but wives say, “Show me the money. I want to see it all in the bank account.” So one of the roles of a great advisor is to bring spouses together to see one another’s point of view. John: I agree! Sometimes it’s the opposite, and we’ll say, “He’s a lake, she’s a river.” Just knowing people’s points of view can be beneficial in facilitating dialogue and planning. Oftentimes, we can help couples see where the river meets the lake. Blake: We can’t underestimate the power of this, because I know that money is a huge source of conflict in many relationships, and a common source of divorce. John: That’s so true. Half the couples in America get divorced, and 70% of these are precipitated by financial disagreements or stressors. If we can help a couple come to terms with financial disagreements early on, we can help keep families together, and that’s a big deal for their kids and grandkids. That’s why Dave Ramsey has such a huge radio program! Blake: No doubt! That’s classic, John, just classic. Hey, as we wrap it up here, any parting shots for us? John: Just thanks. Thanks for having me on; I’ve enjoyed the conversation. I’m looking forward to reading what other people have to say! I think it’s cool you thought of us, and are making this happen. Blake: Well, thanks, but I can’t take any credit for it. I stumbled into it, like I described in that intro, from client ripples and retirements to death. You and your peer group are nearing retirement, and I just couldn’t sleep another night without capturing some of that wisdom. I’m halfway through the season now, and I’m finding everyone to be really ruminative and introspective. John: It’s an honorable thing. Blake: Maybe it’ll mean something to someone, or to their family perhaps. A codification of their thoughts as they reflect on a few professional chapters in their life. John: Have you read Halftime? John: Yeah. It’s a great book. I think—as you’re finding and will continue to find—that what matters in the end is not the “stuff,” it’s the purpose, the values, the relationships, the impact, the legacy. I was with a dear friend and client the other day, who recently lost a young family member in a tragic accident. 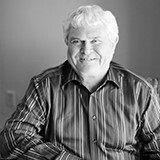 We were there to talk about finances, but once it turned personal and I learned what he was going through, I asked him, “Can I pray for you?” We were in his office, and he immediately dropped to his knees and said, “Yes, let’s pray.” It was automatic, and I thought, “Man, where did that come from?” This is a man of great wealth and success, a pillar in our community, and here we were, humbled together and on our knees. John: That’s it. Perspective. Holding tight to what’s eternal, to His promises and people, then letting the rest go. As soon as Jenny got home, she emptied her penny bank and counted out 17 pennies. After dinner, she did more than her share of chores and she went to the neighbor and asked if she could pick dandelions out of her yard for ten cents. On her birthday, Grandma did give her another new dollar bill and at last she had enough money to buy the necklace. Jenny loved her pearls. They made her feel dressed up and grown up. She wore them everywhere—Sunday school, kindergarten, even to bed. The only time she took them off was when she went swimming or had a bubble bath. Mother said if they got wet, they might turn her neck green. Jenny had a very loving daddy and every night when she was ready for bed, he would stop whatever he was doing and come upstairs to read her a story. One night when he finished the story he asked Jenny, “Do you love me?” “Oh yes, Daddy, You know that I love you.” “Then give me your pearls.” “Oh, Daddy, not my pearls. But you can have Princess—the white horse from my collection. The one with the pink tail. Remember, Daddy? The one you gave me. She’s my favorite.” “That’s okay, Honey. Daddy loves you. Good night.” He brushed her cheek with a kiss. About a week later, after the story time, Jenny’s daddy asked again, “Do you love me?” “Daddy, you know I love you.” “Then give me your pearls.” “Oh Daddy, not my pearls. But you can have my baby doll. The brand new one I got for my birthday. She is so beautiful and you can have the yellow blanket that matches her sleeper.” “That’s okay. Sleep well. God bless you, little one. Daddy loves you.” And as always, he brushed her cheek with a gentle kiss. With tears gathering in his own eyes, Jenny’s kind daddy reached out with one hand to take the dime-store necklace, and with the other hand he reached into his pocket and pulled out a blue velvet case. Inside the case was a strand of real pearls. He handed them to Jenny. He’d had them all along. He was just waiting for her to give up the dime-store stuff so he could give her genuine treasure. What kind of nickel & dime stuff are you holding on to? Securities offered through Raymond James Financial Services, Inc. Member FINRA/SIPC. Investment advisory services offered through John Moore & Associates, Inc.